1Department of Pharmacy, Faculty of Science and Engineering, International Islamic University Chittagong, Chittagong-4318, Bangladesh. Citation: A. H. M. Khurshid Alam, et al (2018). Antioxidant, Free Radical Scavenging, Antibacterial and Cytotoxic Compound from the Leaves of Syzygium Fruticosum. Int J Pharm Sci & Scient Res. 4:6, 69-73. Syzygium fruticosum Roxb. (Abbreviated as SF) , a member of the Myrtaceae family, is a tree and is widely distributed all over the Bangladesh. The plant has a folkloric reputation for promoting diabetes mellitus, bloody dysentery, diarrhea, inflammation, ulcers etc [2-3]. A comprehensive literature review revealed that there is no chemical and biological reported data on this plant. However, fatty acids , steroids , terpenoids , flavonols , flavonoids , phenolics  and tannins  were found in the genus of SF. 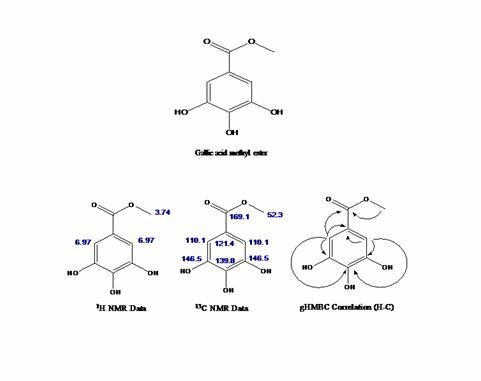 In this study, we report the isolation and characterization of a compound named gallic acid methyl ester (compound1, C-1), and its antioxidant, free radical scavenging, antibacterial, and cytotoxic activities. Figure 1: 1H and 13C NMR as well as HMBC spectral data of gallic acid methyl ester. The leaves of SF (LSF) were collected from the Rajshahi University Campus and were identified by an expert taxonomist at National Herbarium, Dhaka, Bangladesh where a voucher specimen was deposited (Accession number: 1326). The LSF were washed with fresh water to remove dirty material and were sun-dried occasionally for several days. Then the dried LSF were crushed into coarse powder (1000 gm) by grinding machine. The powdered materials were then placed in an amber colored extraction bottle and soaked with 3 liters of 80% methanol. The bottle and its contents were sealed and kept for 7 days with occasional shaking and stirring. The whole mixture was filtered through cotton followed by Whatman No. 1 filter papers, and was then concentrated with a rotary evaporator under reduced pressure at 400C to afford a crude methanolic extract of 30 gm LSF (LSF-M80). The 30 gm of LSF-M80 was successively fractionated with petroleum ether, chloroform, ethyl acetate and finally with water to get four fractions: petroleum ether fraction (PEF), chloroform fraction (CHF), ethyl acetate fraction (EAF) and aqueous fraction (AQF). The EAF of LSF-M80 showed three prominent spots on TLC plates using UV, IR and vanillin-sulfuric acid spray reagent. The extract (4.82 gm) was diluted with small amount of ethyl acetate and subjected to a column of silica gel and eluted with toluene with increasing portions of ethyl acetate, then with ethyl acetate, methanol and finally with water. Depending on the similar TLC behavior, different elutes were combined together and the fractions were designated as F-1, F-2, F-3, F-4, F-5, F-6, F-7, F-8 and F-9. The fractions F-1, F-2 and F-3 were present in very negligible amount. Therefore, fractions F-4, F-5, F-6, F-7, F-8 and F-9 were selected for further investigation. Among these fractions, F-4 and F-6 were subjected to PTLC to get pure compound and showed one distinct spot of each on the TLC plate using different solvent systems of toluene : ethyl acetate and when exposed in I2 vapor. The fractions were then subjected to PTLC and eluted with the above solvent systems. After evaporation of solvent under reduced pressure, F-4 and F-6 turn into deep brown colored mass and needle shaped white crystal, respectively. Further TLC analysis of these compounds in different solvent systems also showed single spot, which might be the indication of single compounds. Antibacterial and cytotoxic activities were tested by disk diffusion assay method [11-13] and by brine shrimp lethality assay [16-17], respectively. All bacteria (listed in Table 1) were obtained from the stock cultures of the Microbiology Lab, Department of Pharmacy, University of Rajshahi, Bangladesh. 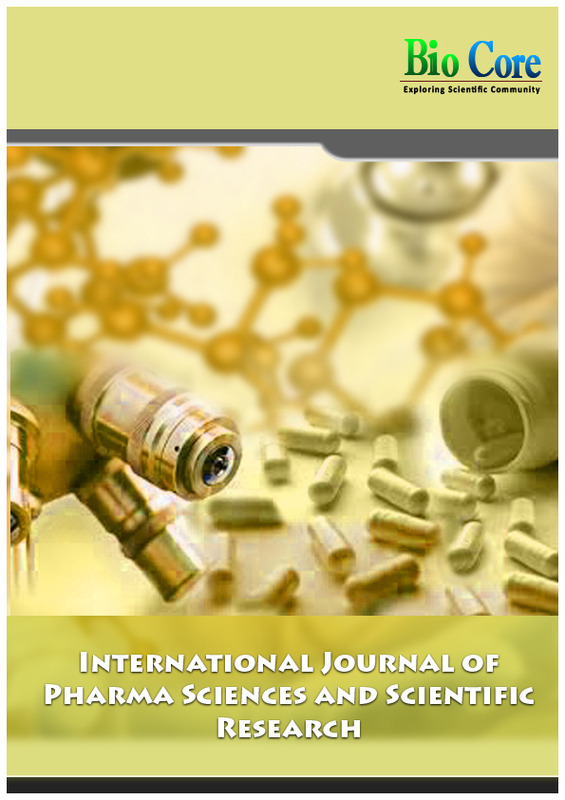 The ferrous reducing antioxidant capacity  and DPPH radical scavenging activity  were examined by standard spectrophotometric methods. The leaves of Syzygium fruticosum (LSF) were extracted with 80% methanol to get the crude methanolic extract of LSF ((LSF-M80). The LSF-M80 was successively fractioned with petroleum ether, chloroform, ethyl acetate, and finally with water to get four fractions: petroleum ether fraction (PEF), chloroform fraction (CHF), ethyl acetate fraction (EAF) and aqueous fraction (AQF). Qualitative phytochemical screening revealed the presence of flavonoids, phenolics, saponins, tannins, steroids, and glycosides (Table 1). Based on this result, EAF was subjected to column chromatography to give gallic acid methyl ester (compound1, C-1). C-1 was obtained as white crystal. It appeared as brown colored spot on the TLC plate with I2. The C-1 is soluble in methanol and sparingly soluble in ethyl acetate and chloroform, but insoluble in petroleum ether and n-hexane. The Rf value of the C-1 was 0.6. From the 1H NMR spectrum of C-1 (in CD3OD), it was found that the C-1 possesses an aromatic signal at δ 6.97 (2H, s) and one methoxyl signal at δ 3.74 (3H) ppm, indicating the presence of a substituted aromatic moiety. The 13C NMR spectrum showed four aromatic signals at δ110.09, 121.47, 139.84 (C-4) and 146.56 ppm, one carboxylic ester at δ 169.11 ppm and one methoxyl carbon at δ52.37. These 1H and 13C NMR spectral data as well as HMBC correlation and previous literature report  suggested the structure of C-1 was gallic acid methyl ester. The results of antibacterial activity [11-12] of LSF-M80 and C-1 are given in the Table 2. The LSF-M80 and C-1 showed significant antibacterial activity against all tested pathogenic bacteria at a concentration of 200 µg/disc. The MIC value was determined by serial dilution technique . The MIC values of LSF-M80 were found to be 32 µg/ml against all tested bacteria; on the other hand, the MIC values of C-1 were 8 µg/ml against Staphylococcus aureus, Escherichia coli, Shigella sonnei and Pseudomonas aeruginosa and 16 µg/ml against Bacillus cereus and Shigella boydii. The antibacterial activity of C-1 was similar to previously published data . Table 2: In vitro antibacterial activity of LPF-M80 and C-1LSF-M80= 80 percent methanolic extract of leaves of Syzygium fruticosum; C-1= Compound-1; K= standard kanamycin. The control disc containing the solvent had no zone of inhibition. The LSF-M80 and C-1 also showed a strong cytotoxic effect with ED50 of 14.0 and 4.0 μg/ml, respectively. Strikingly, the C-1 showed higher ferrous reducing antioxidant and free radical scavenging activities when compared with the standards like ascorbic acid (AA), gallic acid (GA), and butylated hydroxytoluene (BHT) suggest that the C-1 could be used as reference standard as well as could be considered as a drug to treat several diseases caused by free radical. The author(s) declare(s) that there is no conflict of interests regarding the publication of this article. The authors want to give thank Dr. Mukhlesur Rahman, Senior Lecturer, School of Health Sport and Bioscience, University of East London for taking NMR data and characterize the compound. The authors also wish to thank the National Herbarium, Dhaka, Bangladesh for identification of the plant. The authors declare that they have no fund for this research.